and the SOMERSETSHIRE COAL CANAL. THE CRUSE MAP &emdash; The B.R.L.S.I. plans for its future. ADITS ('Levels') AND THE S.C.C. A GIFT OR A LEGACY? THE STANDARD BRIDGE PATTERN OF THE S.C.C. A NOTE ON SOME STEAM ENGINES ON THE S.C.C. A NOTE ON STONE CARRIAGE ON THE S.C.C. "... AND THIS IS THE DRY DOCK"
NEW BOOK -- "The Somersetshire Coal Canal -- A Second Pictorial Journey"
NAVVYING NOTES -- Work at the Lower Locks; Two Major Work Parties; Allen Scythe Stolen. CRUISEWAY STATUS FOR THE K.&A.C. BOOK REVIEW -- "Queen of Waters"
A NEW BOOK -- "Men of Iron"
SHAREHOLDERS OF THE S.C.C. -- JOHN BILLINGSLEY Esq. A SOMERSET NAVIGATION -- How a musical came to be written about the S.C.C. WHERE IS THIS? -- A mystery picture of the S.C.C. BOOK REVIEW -- "A History of the Fullers Earth Mining Industry Around Bath"
TECHNICAL TOPICS -- Why is the towing path on the downhill side? "THE DIARY OF A ROWING TOUR FROM OXFORD TO LONDON IN 1875"
NATIONAL WATERWAYS FESTIVAL -- Help wanted. "THE HISTORY OF THE SOMERSET COALFIELD"
THE MYSTERY OF THE JUNCTION - A walk to find the site of the proposed D&SC junction with the K&A canal. 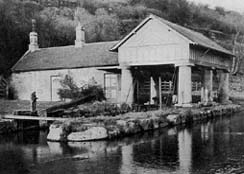 A STONE WHARF NEAR THE VIADUCT HOTEL?